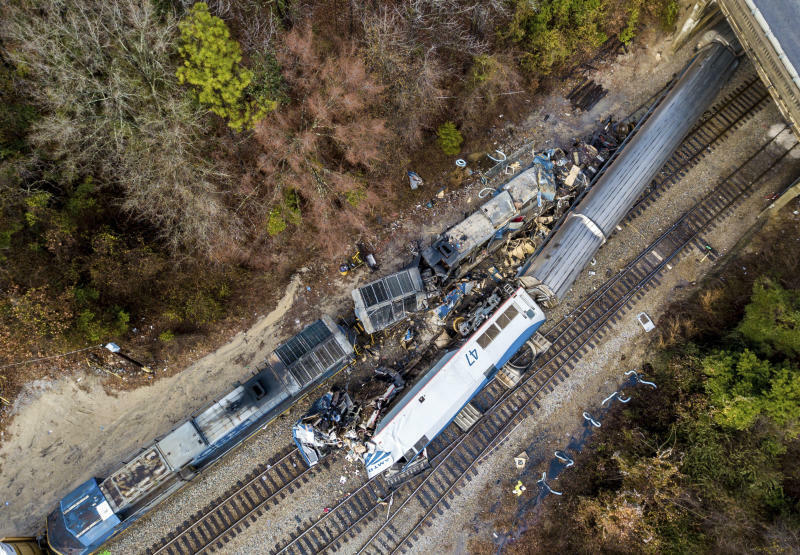 Amtrak blamed a freight rail operator for causing a crash on Sunday that killed two people and injured more than 100 others when one of its passenger trains was diverted onto a side track and slammed into a parked, unmanned freight train in South Carolina. In the U.S. passenger rail operator’s third fatal crash in as many months, Amtrak Train 91, carrying nine crew members and 136 passengers, was travelling from New York to Miami when it hit the CSX Corp freight train that was stopped on a side track, or siding, at about 2:35 a.m. (0735 GMT). Amtrak President and Chief Executive Richard Anderson said CSX was responsible for the tracks and signals, including one that had a lock attached to it and diverted the Amtrak train onto the side track. “CSX had lined and padlocked the switch off the mainline to the siding, causing the collision,” he said in a statement. CSX did not address the comments by the Amtrak CEO but said it was working with federal investigators. Both Amtrak and CSX offered their condolences to the families of the two people who died. Robert Sumwalt, chairman of the U.S. National Transportation Board, told a news conference the section of track was operated by CSX and there was a padlock on the switch that steered train traffic onto the siding. “Key to this investigation is learning why the switch was lined that way,” he said, calling the damage to the locomotives “catastrophic.” An NTSB investigation team was at the site. Amtrak engineer Michael Kempf, 54, of Savannah, Georgia, and conductor Michael Cella, 36, of Orange Park, Florida, were killed, Lexington County Coroner Margaret Fisher told reporters. Autopsies were being conducted, she said. Two of the 116 people injured were in critical condition after the wreck, which occurred about 5 miles (8 km) southwest of the state capital, Columbia. Anderson said the passenger train hit the tail end of the CSX train. That train had two locomotives and 34 empty auto racks used to transport cars, the NTSB said. The passenger train’s locomotive was left lying on its side, and the first car was bent and also derailed, although it remained upright, images from the scene showed. At least four of the freight train’s cars were crumpled, looking like crushed tinfoil, but remained on the tracks. The passenger train was part of Amtrak’s Silver Star Service. Officials said some 5,000 gallons of fuel leaked as a result of the collision but that there was no threat to public safety. McMaster said he had been told the Amtrak train was travelling at about 59 miles per hour (95 kph) on impact. The NTSB did not release details on the speed at which the Amtrak train was travelling. In December, three people were killed when an Amtrak passenger train derailed in Washington State. The engineer later told the NTSB he had misread a signal and tried to break before the accident. In late January, an Amtrak train carrying Republican members of the U.S. Congress killed one person in a garbage truck with which it collided in Virginia. A Federal Railroad Administration Investigative team was also on the scene in South Carolina to help establish what happened.